There is no question that video is playing a bigger role in marketing than ever before. Marketers are tasked not only with determining what type of content to create to engage customers, but they must also decide on the best method for deploying videos. For those who are new to video, it may seem easy and effective to host your videos on YouTube. Newcomers are partially right. It is easy, but it’s definitely not the most effective video player for most businesses. Here are five reasons why your company should host videos using a YouTube alternative. YouTube has a lot of traffic! There is no denying that. And generally marketers want to be where most customers are. According to 2018 YouTube Statitics from Vlogging Guides, there are almost 1.5 billion regular users who watch over an hour of video on YouTube every single day. That’s a ton of views, but it also means there is stiff competition, making it hard for your company’s videos to stand out. If your brand creates a lot of helpful how-to content, YouTube is a great place to upload. The core YouTube audience uses the platform to either find answers to questions or for entertainment purposes. However, if you have video goals like lead generation or creating ROI, try a YouTube Alternative. This will help you better connect with people who are seeking out the information you provide. Even if people do view your videos on YouTube, there is no guarantee they’ll visit your site. YouTube allows you to put annotations over your videos, but those annotations lead to more YouTube content. Instead of expecting your audience to move from YouTube to your website to convert, get them directly to your website to watch the video. The easiest way to get them to your website is to bypass YouTube all together. If you host a video on your website using a YouTube alternative like Wistia or Vidyard, you’ll be able to more easily connect viewers to the sections of your website where they can purchase your product or service. YouTube Analytics provides some valuable information including performance, estimated minutes watched, and traffic sources. But third party players can provide all of that information and more. Valuable sources of data provided by these other players include viewer drop off (times in which viewers stopped watching), engagement rates, heat maps for each viewer’s session, and connection to conversion points like lead captures to measure ROI of the video. This type of detailed information can be critical for decision making. The way consumers view and engage with video can play a big role in how effective your content is. You have little control over the viewer experience in YouTube. All uploads use a generic viewer format. 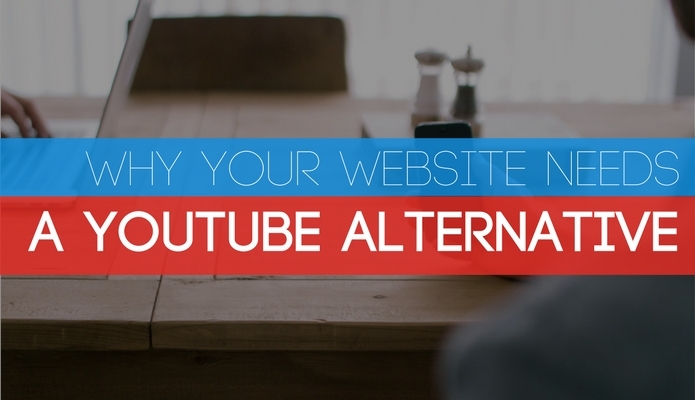 Other YouTube alternatives allow you to tailor the delivery of video content. You can even customize player formatting to match your brand. This helps your company maintain a consistent image in the eyes of viewers. In using a third party player, you’ll also have more control over the next steps viewers take. You can include annotations that link to your website or vanity page. This will help bridge the gap between visitor viewing to visitor conversion. By integrating with a Marketing Automation Platform, like Hubspot, you can even track in real-time who is watching a video so that you can proactively respond. One of the biggest benefits of using a YouTube alternative on your website is that advertisements do not pop-up before the video plays and viewers are not distracted by other content. The attention span of many viewers is limited. Some will choose to click away if forced to watch an advertisement. Hosting videos on your website allows you to deliver desired content to viewers immediately. Another problem with having videos on YouTube is that you can’t control what advertisements play before your video. Sometimes, the commercials are those of competitors, the opposite of the messaging you want a potential customer to be exposed to. Hosting videos prevents this mishap, sending viewers directly to your content. YouTube wants to keep their audience engaged. Suggested videos surrounding the main video and auto-play videos following the current video all encourage viewers to stay on YouTube and watch other videos. This means that it’s easy to get lost in the sea of information. Here’s a handy guide that will help you decide where to post your videos. For views, awareness, and subscribers: YouTube. To generate new leads, create ROI, keep people on your site, and recommend content: Vidyard. YouTube has its purpose. If your goal is to raise awareness or promote your YouTube Channel, upload away! We even built out an eBook with the sole purpose of increasing your rank and optimizing your channel. But if your business wants to attract traffic to its website and make conversion as easy as possible for customers, try hosting your videos using a third-party player. Yes, these players cost more than YouTube. But what are more conversions worth to you?